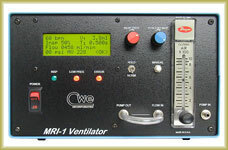 The MRI-1 Ventilator is a small animal ventilator designed for use in MRI and other high magnetic field environments. The system comprises a microprocessor-based control unit and a set of remote, pneumatically operated, non-magnetic valves. The MRI-1 can operate by itself or can be controlled and/or monitored by a computer. How it works: The MRI-1 operates on the flow-time principle: an inspiratory airflow is established and gated into the animal for a known time, thus producing a known volume. This approach provides extraordinary flexibility — a wide range of volumes, breaths-per-minute, and I/E ratios are possible with no hardware changes, and using just three front-panel controls. For small animals, respiratory airflow is provided by an internal air pump. Alternatively, an external pressurized gas source can be attached (oxygen or anesthetic gasses). The remote pneumatic valves do the actual airflow switching. By locating these valves close to the animal (including inside the magnet bore if necessary), dead-space and tubing compliance are minimized. A range of valves is now available for animals ranging from mice to pigs. Rodent-size valves are supplied standard, and larger valves can be purchased later as required. Operation: Setting up and operating the MRI-1 is easy. Flexible tubing connect the control unit and the valves, providing respiratory airflow and pneumatic control pressure to the valve. Only three controls are required: respiratory rate is set in breaths/minute; the flow rate is set using the front-panel flowmeter (and measured internally by a mass flowmeter); and the percent inspiration is set to establish the ratio of inspiration to expiration time (I/E ratio). All respiratory parameters are shown on the front-panel LCD display. The tidal volume and minute ventilation reflecting the current settings is also continuously displayed, and can easily be changed by adjusting the flow rate. Expandable: The MRI-1 can also be used in other than magnetic environments. Because of the non-electrical nature of the ventilation valves, this unit is particularly well suited to sensitive electrophysiology recording situations. Besides the standard miniature pneumatic valves, the MRI-1 also accepts any of the solenoid valve assemblies available for the popular SAR-830 series ventilators. Using the MVA-4 multi-valve expander, it is also possible to ventilate several rodent-sized animals simultaneously using just one MRI-1 as the control unit. The external valves operate synchronously, but tidal volumes are independently set by varying the flow rate to each valve assembly. Installation requirements: A source of compressed air or helium (approximately. 20-50 psi) is required for operating the pneumatic valves. This is attached to the rear panel of the unit, and the pressure is internally switched on or off as required for remote valve operation. Helium is often used as the actuating gas because its lower density and viscosity permits somewhat faster valve switching.